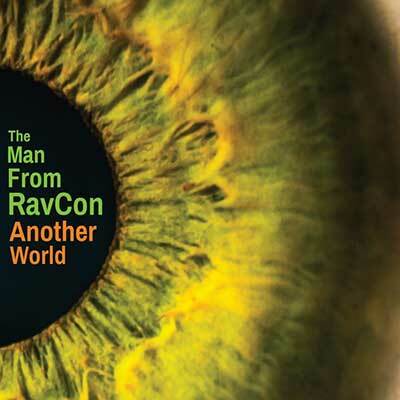 Mike Brown’s latest ‘Man From RavCon’ release is a little lighter than previous efforts but fans of Brown’s experimental prog-heavy sound will still find much to enjoy about this ninth release. Entirely written, arranged and produced by Brown, the album starts off with Colossus, a seven-and-a-half-minute sonic dreamscape that sounds deceptively mellow at its starting point but which gets a little funkier and groovier as it progresses. Goblin-esque synths and pulsing keyboard work set the stage nicely, while some guest lead guitar work from Larry Smith makes the album’s opener stand out a bit. There’s a sort of loose, Keith Richards-esque tone to some of the guitar work here that contrasts nicely with the proggier elements. Satellite Flight, if the title didn’t give it away, is a bit of a spacey-sounding track, the kind of music that makes you feel like you’re flying even when you’re sitting at a desk typing a review listening to the album on headphones. It’s light, but intricately layered, so you almost don’t notice the depth to the production at first but listen carefully, it’s there. At three-and-a-half-minutes it doesn’t overstay its welcome and it proves an enjoyable piece of instrumental pysch. Max The Cat opens with a sort of ‘bossanova’ style sound to it, almost as if you should be listening to it while on vacation with your mom while she’s drinking Pina Coladas and you’re trying to figure out what to do with yourself. It’s a light and breezy little jam that clocks in at four-and-a-half-minutes and that features some pretty cool flute work from Jeff Eacho which, by default, kind of makes you think of Jethro Tull or Hawkwind without ever getting as heavy or aggressive as they did. This one is remarkably chill. The three-minute Code Red opens with some tight, jazzy drumming before some fairly aggressive guitar work comes into the mix, signaling that this track is going to feature a bit more urgency than the three that came before it. The synths wash over it around a third of the way through, creating an appropriately trippy vibe that works really well, before bringing everything to slower, more mellow conclusion. Promised Land is a six-minute piece that starts off with some mellow acoustic strumming, intermittent percussion backing it. It changes up a bit and we get a little bit of the surf guitar sound that earlier Man From RavCon projects featured so prominently worked into the mix, as well as what sounds like an organ of some sort. It builds nicely, and again, is a track worth listening to at an appropriate volume so that you can take in the different layers of the music. The Garden, which features more of Eachos’ flute work and tracks at just short of six-minutes, has a bit of a Pink Floyd vibe to it when it opens, but from there it gets a little more upbeat than pretty much anything they did. It’s got a very relaxed tone to it, even the guitar work sounds quite peaceful here. The four-minute A Peaceful Transition couldn’t be better named. It is, as you’d expect after reading that less than subtle sentence, a very peaceful number. It’s a bit on the repetitive side, the keyboards keep a very simple musical pattern going through the entire track, but off of that Brown experiments with different percussion and guitar work to create the kind of track that could easily lull you off to dreamland if you were sleepy enough when listening to it. It’s very soothing. The title track, a seven-minute space-jam that sort of creeps up on you and sneaks in through your mind’s backdoor to pull you into a trance. It’s a definite trip, the kind of song that might be enhanced through abusing a substance of your choice, but a track that also shows inspired creativity not just in the playing but in the mixing as well. The bass line seems to stay the same from start to finish, deceptively simple, but off of that Brown takes his guitar to strange places and you find yourself happy to go along for the ride. Last but not least, the album finishes off with the four-minute Pole To Pole, a track heavy on the keyboards and the drum machines to the point where when the guitar work does kick in, you kind of don’t expect it. Like everything else on the album, it’s very mellow, very calm and yeah, relaxing in the way that mellow, calm music can be. It’s a few steps away from the earlier RavCon albums but a natural progression of sorts and a worthy addition to Brown’s eclectic discography.